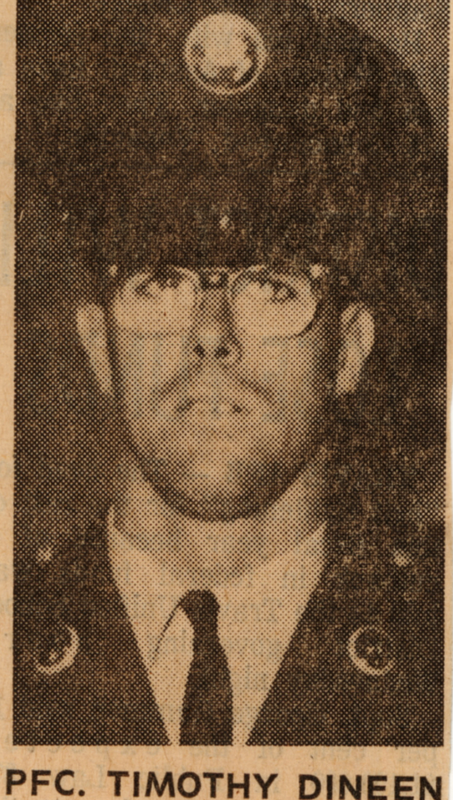 PFC Timothy J. Dineen was killed by hostile fire during the Battle of Kontum, Tet Offensive, 1968. Tim was part of security at the firing range ambush in Kontum in February, 1968, who was KIA when the NVA attacked him in the observation hut where he was on lookout. 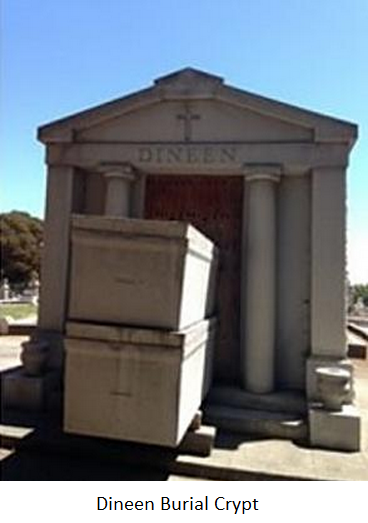 He was buried in a crypt in Vallejo, CA that was vandalized for the metal gate and panel. Thomas Minero was a high school friend of Tim’s who has taken it upon himself to restore the crypt to honor the sacrifice Tim made in protecting his fellow soldiers. The information is listed below as to where to send your donation and what a great job Thomas has done in setting up the fund. Won’t you please join me in honoring the sacrifice that Tim made almost 50 years ago. Please pass this info on to those vets who served with Tim to let them know what is being done to restore the crypt. I have included Thomas’s contact info in case you have any question;so please feel free to contact Thomas or Doc. Thank You for respecting Tim’s memory and honor. The crypt where his body is interred has been the victrim of vandalization over the past couple of years. Brothers-in-arms and concerned friends are undertaking the repair and restoration of the crypt, and need help. Tom Minero is the executor of the account which will cover the costs, and Tom will oversee the efforts and work. I am a native Vallejoan from California, and a younger classmate of Timothy J. Dineen, a member of Company C, 1-22, who died in the Battle of Kontum on Feb. 5th, 1968. Through fellow soldiers, Charlie”Doc” Shyab, Fred Childs, and Mike Stokes I have started an effort to restore the crypt of Tim Dineen, which was vandalized sometime over the last two years. Tim was an only child and has no surviving relatives to call on. As a result, I have established a Memorial Fund in his name to collect donations to cover the repair cost of $2,612.00. A number of Vallejoans and a few soldiers who knew Tim have stepped up to the plate, but we are only half way to our goal. If you can help spread the word about this crusade to preserve Tim’s grave and honor, I would appreciate it. I am listed as the executor of the account. Donations can be made at any U.S. Bank branch, or checks can be mailed to me for deposit. Checks should be made out to the Timothy J. Dineen Memorial Fund. I don’t know how you put all this together to reach out to the folks to help restore Tim’s resting place, but you did one admirable job that put the Company in a great light. I am so proud to be part of the unit and be in touch with all the caring members of a great group that live up to our motto “Deeds not Words”.